Released in 2003, the Copystar RI-2530 is a desktop digital copier with optional print, scan and fax functionality available as well as many finishing and paper handling options, some of which may set the RI-2530 apart from other models for you. Unlike some other models from that time period, this one in particular shows its age in its print quality and speed, making it difficult to recommend for the large workgroups it was made for. The copier measures 23" by 25" by 29" and weighs 165 lbs. It is likely too large and heavy for a desk and will fit best on a credenza or in its own cabinet. The copier produces copies at speeds of 25 pages per minute, which slows to 18 pages per minute on legal-sized paper and 15 on ledger-sized paper. While this is above the standard 20, it is behind the much more impressive print speeds of 40-50 pages per minute offered by newer models like this one. It also produces documents at a maximum resolution of 600 by 600 dpi, which is consistent with contemporary copiers but lagging behind in printing and scanning, where documents can be captured at 1200 dpi on systems like this one. The copier has a standard paper capacity of 1200 sheets across two 500 sheet drawers and a 200 sheet multi purpose tray. Conveniently, the copier also features automatic selection and switching, and can be expanded to a total of 4200 sheets by installing a 3000 sheet large capacity tray. Both the drawer and the multi purpose tray support printing on paper sized between 5.5" by 8.5" and 11" by 17" though the large capacity tray prints only to letter paper. The RI-2530 supports printing to bond paper, recycled paper, transparencies, labels, and envelopes. Duplex printing is available with a duplex unit add-on, which prints to paper sized between 5.5" by 8.5" and 11" by 17". 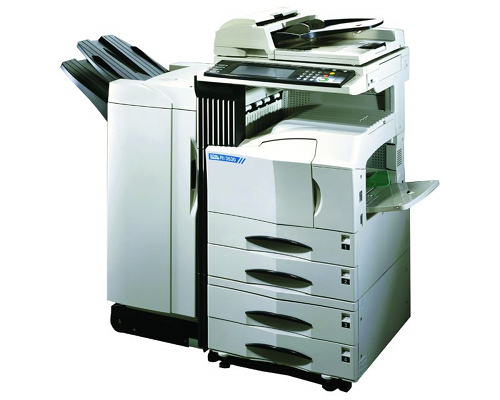 The copier supports enlargements and reductions between 25% and 400% in size and can produce up to 999 copies at a time. It also supports auto magnification, batch copies, book and booklet modes, image combinations, covers, erasing, image overlay, rotation, reverse, margin shifts, mirroring, pave numbers, transparencies, and an XY zoom, giving it a fairly diverse feature set. Finishing options include a reversing automatic document processor able to process 100 sheets per minute, a sheet through automatic document processor rated at 70 sheets per minute, a 3000-sheet finisher with staple and hole-punch capabilities, a 1000-sheet saddle stitch finisher, a 500-sheet internal finisher, and a multi-bin mailbox, as well as a bar code reader, a feature few other models possess. The RI-2530 comes with 32MB of RAM standard, upgradable to 160MB if desired. Printing is available with an optional print/scan system add-on. It includes 32MB of RAM upgradeable via 100-pin DIMMs to 288MB, and an optional hard disk is also installable if desired. The print/scan system connects via 10/100Base-TX Ethernet, IEEE-1284 Parallel, or RS-232C Serial, or optionally via 802.11b or 10Base2. The scanning unit scans at resolutions of 200-600 dpi at speeds of up to 25 sheets per minute, output via either PDF or TIFF. It is driven only via TWAIN and supports scan-to-file, scan-to-email, and TWAIN. The optional fax/network fax system features a 33.6kbps modem and compresses images via JBIG, MMR, MR, or MH. It features 8MB of RAM with a maximum of 16MB possible and transmits at a speed of approximately 3 seconds per page. The copier and printer have very low memory capacities compared to newer models like this one. Additionally, the base price will not include print, scan, or fax functionality, requiring additional purchases in order to make the RI-2530 serve as a true multifunction unit. 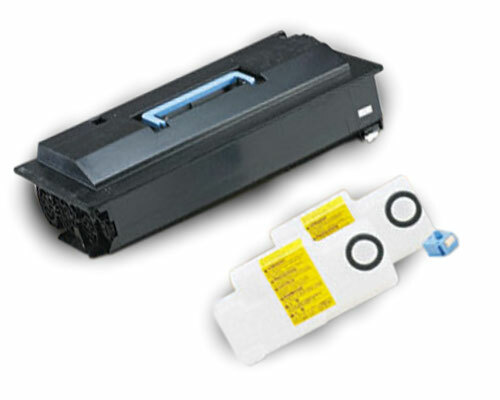 Review it: "Copystar RI-2530 "
The RI-2530 consumes black toner, which includes a grid cleaner and two waste containers. The toner cartridge produces 34000 pages at an average of 5% coverage before needing to be replaced. 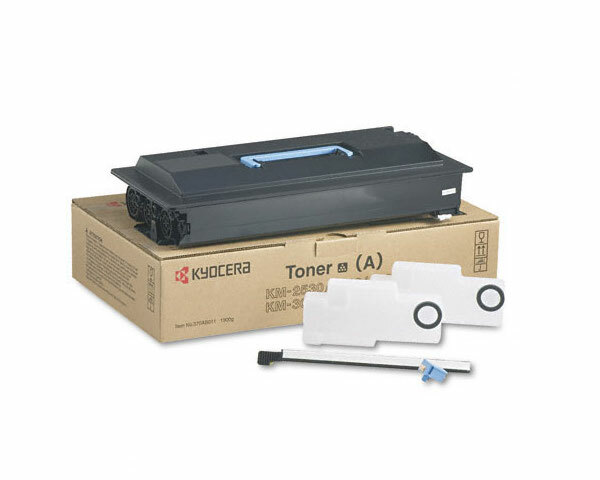 Cartridges include additional consumables, bringing down costs and ensuring that other components are replaced alongside the toner.